‘There’s everything in it to please the art lover’. That was the art dealer Ambroise Vollard’s verdict on Cézanne’s painting, ‘Bords de la Marne’. “A river, a boat with people in it, houses in the background, trees,” continued Vollard, who remembered this painting appearing in the first exhibition of Cézanne’s held in his gallery in Paris in 1895. 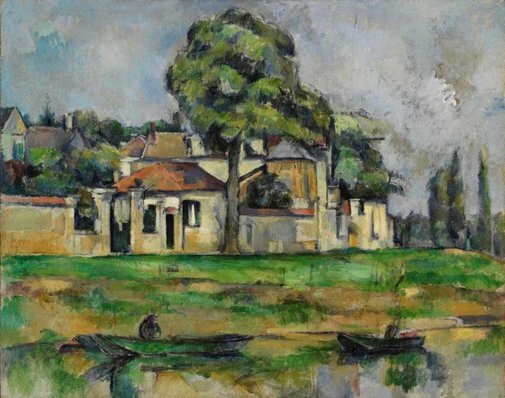 Vollard remembered it quite accurately: ‘Bords de la Marne’ is a majestically composed landscape which epitomises Cézanne’s classical qualities. Painted on a canvas of his favourite dimensions (63 x 79 cm), Cézanne set out zones of sky, buildings, embankment and water in a sequence of horizontal bands – which is a distinctive mannerism of many of his landscapes. Putting order into his brain meant putting order into his art. Cézanne painted and drew relentlessly. He used this period of his invisibility and anonymity in the art world to consolidate the body of work that would win him acclaim, from 1895 onwards, as the supreme modernist master. Cézanne was fortunate in being financially independent, which relieved him of any thought of painting to please and painting to sell. Such was his disinterestedness, integrity and uncompromisingly sincere commitment to his art that he became a role-model for several generations of modern artists. Almost every summer he and his family would rent an apartment or take rooms in a hotel somewhere in the Ile-de-France, usually within visiting distance of Impressionist colleagues like Pissarro, Monet or Guillaumin, or near old friends like Emile Zola and Paul Alexis. ‘Bords de la Marne’ was painted not far from the eastern outskirts of Paris. This is a region that has attracted many generations of artists, beginning with Watteau in the 18th century. The Paris-Mulhouse railway line opened in 1854, making the closely adjoining towns of Alfortville, Créteil, Joinville, La Varenne Saint-Hilaire, Chennevières, Saint-Maur, Champigny and Joinville readily accessible to painters from Paris. Corot, Pissarro, Guillaumin and the Douanier Rousseau all painted in or near this cluster of towns. Cartier-Bresson took some famous photographs of working-class picnickers on the banks of the Marne and Jacques Tati filmed ‘Mon Oncle’ in Joinville. Cézanne must have enjoyed the area very much. There are twenty or so paintings in his catalogue raisonné which may be identified (some more tentatively than others) with sites along the Marne. Due to the fact that Cézanne didn’t sign, date or title his paintings, many aspects of his “underground years” are an insoluble riddle. Nonetheless, John Rewald and Walter Feilchenfeldt, the authors of the catalogue raisonné, propose for the Marne landscapes a range of dates that extend over quite a long period: 1888-90; c.1894; 1895-98; 1904. Although there is an element of guesswork to these dates, they offer proof that Cézanne had a special fondness for this region and returned many times to paint it. The painting ‘Bords de la Marne’, like Cézanne himself, has spent a period of time “underground” – that is to say, it has been out of the public eye. It has been in one family’s private collection for more than a hundred years. Originally it formed part of the legendary Pellerin collection, and has remained until now with Pellerin’s descendants. Auguste Pellerin made a fortune manufacturing margarine. He began collecting Cézannes in 1899, and it is estimated that at least 150 of Cézanne’s paintings passed through his hands. At its apogee his collection numbered more than a hundred Cézanne paintings as well as some watercolours. His house in Neuilly was visited by various artists, including Paula Modersohn-Becker and Henri Matisse (Matisse painted Pellerin’s portrait in two versions). The magazine L’Amour de l’art, edited by Waldemar George, proposed to reproduce all the Cézannes in Pellerin’s collection and commissioned Roger Fry to write an essay to introduce them. This essay became the basis of Roger Fry’s ‘Cézanne: a Study of His Development’ (1927) which remains among the greatest books ever written about Cézanne. Robyn Beckley, Look , 'Member profile', Sydney, Dec 2015-Jan 2016, p 10, col illus p 10 (detail). Edmund Capon, Foundation Newsletter #13 , 'Cézanne dream realised', Sydney, Dec 2008, np. Edmund Capon, Look , 'Letter to the Society from Edmund Capon... about the Gallery's Cézanne', Sydney, Mar 2009, pp 10–11, col illus p 11 (installation shot). Nicholas Chambers, Look , 'Morandi meets the Modernists', Sydney, Mar 2016, pp 28–30: p 28. Douglas Cooper, The Burlington Magazine, vol 96, no 621 , 'Two Cézanne exhibitions - II', London, Dec 1954, pp 378–81, 383: p 379. Denis Coutage, Cézanne and Paris , 'Landscapes of the years 1888–1905', Paris, 2011, pp 134–47: p 138. Roger Fry, Samleren, vol 5 , 'Cézanne's Udvikling', 1928, pp 101–03, 113–19: illus p 116. Roger Fry, L'Amour de l'Art, vol 7 , 'Le développement de Cézanne', Paris, Dec 1926, pp 389–418: pp 406–07, illus p 397. As 'Maisons au bord de la Marne'. Adam Fulton, Sydney Morning Herald , ‘From the natural to the abstract, a momentous evolution’, 25 Jun 2010. Emma Glyde, Look , 'Members' gallery: the next decade', Sydney, Jul 2013, pp 22–30: p 24. Terence Maloon, Look , 'A Cézanne for Sydney', Sydney, Oct 2008, pp 28–31: pp 30–31, col illus cover (detail), pp 28–29. Lisa-Marie Murphy, Look , 'Building the Gallery's collection', Sydney, Mar 2015, pp 33–34: p 33. Jill Sykes, Look , 'Those objects of desire: helping to put them in the Gallery collection', Sydney, Mar 2010, p 17. Aida Tomescu, Look , 'The art that made me', Sydney, May 2015, pp 14–15: pp 14–15, col illus p 14. Tout l’œuvre peint de Cézanne , Paris, 1975, p 120, no 735, illus p 119. Paths to abstraction 1867-1917 , Sydney, 2010, pp 107, 113, col illus p 113. Paul Cézanne , 1975, p 173, illus p 174. As 'The banks of the Marne'. Cézanne: a study of his development , New York, 1960, pp 61–62, illus pl X, fig 26. Souvenirs d’un marchand de tableaux , France, 1957, pp 57–59. Art Gallery of New South Wales annual report 2008–09 , Sydney, 2009, pp 6, 14, 16, 21, 62, 63, 74, 85, col illus p 17. Hommage à Cézanne , France, 1954, p 22, no 56, illus pl XXV. Cézanne: son art – son oeuvre , Paris, 1936, vol 1, p 202, no 632, illus vol 2, pl 632. (also repr San Francisco 1989). As 'Bords de la Marne'. Look , 'Our Cézanne', Sydney, Feb 2009, pp 32–34, col illus p 33. Recollections of a picture dealer , 1936, p 74. (also Dover Publications, New York, and in French: Souvenirs d'un marchand de tableaux, Albin Michel, Paris, 1937). Initiation à l'art moderne: Cézanne , Paris, 1936, illus p 77, pl 48. (also in English, A Zwemmer, London, 1939 and reprint Skira, Geneva, 1954). Cézanne: a study of his development , England, 1927, illus pl X, fig 26. (2nd edition London 1932). As 'Maisons au bord de la Marne'. Le maître Paul Cézanne , Paris, 1923, 217, illus opp p 78. As 'Maisons au bord de la Marne, à Créteil'. P. Cézanne à Paris et en Île de France , Marseille, 2011, p 104, col illus p 104. As 'Maison le long du chemin de halage sur les bords de la Marne à Créteil' with old postcard view of motif, dated circa 1894. Art Gallery of New South Wales Foundation: Celebrating 30 years of art acquisitions , Sydney, 2015, pp 6, 37, col illus cover (detail), p 38. Art Gallery of New South Wales annual report 2013–14 , Sydney, 2014, p 4. Cézanne: landscape into art , 2014, pp 15, 139, col illus p 138, fig 48a. Cézanne: Site/Non-site , Madrid, 2014, p 182, col illus p 158, no 61. Art Gallery of New South Wales annual report 2012–13 , Sydney, 2013, p 5.
art lovers: the story of the Art Gallery Society of New South Wales 1953-2013 , Sydney, 2013, pp 165, 299, col illus p 299. 'Chapter 6: 'Engaging the audience 2000–2012' by Judith White, pp 139–69; 'Acquisitions funded by the Art Gallery Society 1953–2013', pp 192–314. Art Gallery of New South Wales annual report 2011–12 , Sydney, 2012, p 92. Cézanne. Paris–Provence , Tokyo, 2012, col illus p 61, no 32. Art Gallery of New South Wales annual report 2010–11 , Sydney, 2011, pp 10, 72. Art Gallery of New South Wales annual report 2007–08 , Sydney, 2008, pp 13, 17, 56. Cézanne: Finished, Unfinished , Zurich, 2000, p 380, illus p 380, fig 2. As 'Bords de la Marne'. The paintings of Paul Cézanne: a catalogue raisonné , New York, 1996, vol 1, p 414, no 628, illus vol 2, p 212, fig 628. As 'Bords de la Marne'. Art Gallery of New South Wales annual report 2009–10 , Sydney, 2010, p 65, col illus p 43 (in situ).